Fast Duplicate File Finder 3.0.0.1 is released. Version 3.0.0.1 of Fast Duplicate File Finder is now available for download. The new release includes a handy Quick Check/Uncheck functionality. 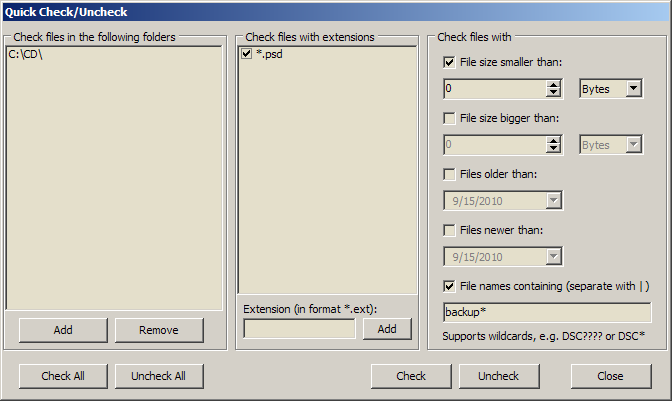 It allows you to check/uncheck files by their folder, extension, file size, file date, etc. (available only in Pro version). You can see the new feature on the screen shot below. A new option to automatically log-off, shutdown, hibernate or stand-by the system after scan is finished is added. The speed of the pre-processing stage is increased dramatically when scanning large quantities of files. A command-line option “-run” which automatically start the scanning process after the program is started is now available in the Pro version. This entry was posted in Fast Duplicate File Finder, News on December 23, 2010 by MindGems Support.